St Dunstan’s Catholic Church in Woking is celebrating the unveiling of the second in a series of two specially commissioned stained glass windows. Both bespoke windows measure 13.5 square metres, and were designed by architectural glass artist Derek Hunt as a result of a donation made by an anonymous benefactor. First founded in the town in 1925, St Dunstan’s relocated to a new site last year. As part of the new build, two feature windows were specially commissioned. The first, the Tabernacle window entitled “The Bread of Life” was completed in July 2008 with the most recent addition located between the pews and the Sanctuary, installed this month (December 2009). 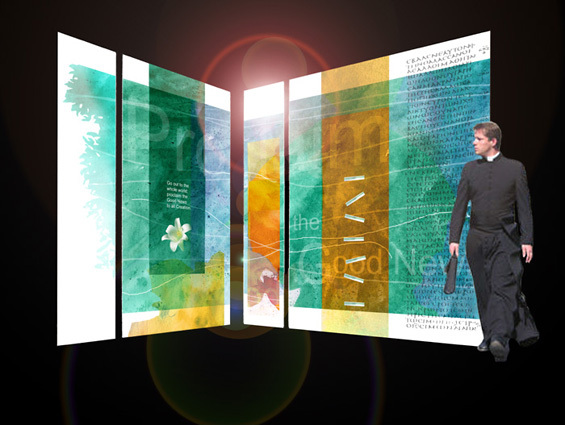 The new screen, entitled “Proclaim the Good News” was created using hand painted enamels, airbrushed paints and applied antique glass. 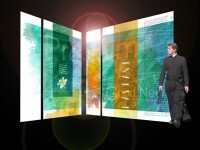 The glazed screen incorporates a natural theme with the suggestion of leaves, flowing water, the silhouette of trees and a white lily, the symbol of the Virgin Mary. The right hand panel has prisms running vertically which act as light catchers, to split and refract the light into a rainbow of colours as the sun passes across the window. This entry was posted in architectural, design. Bookmark the permalink.